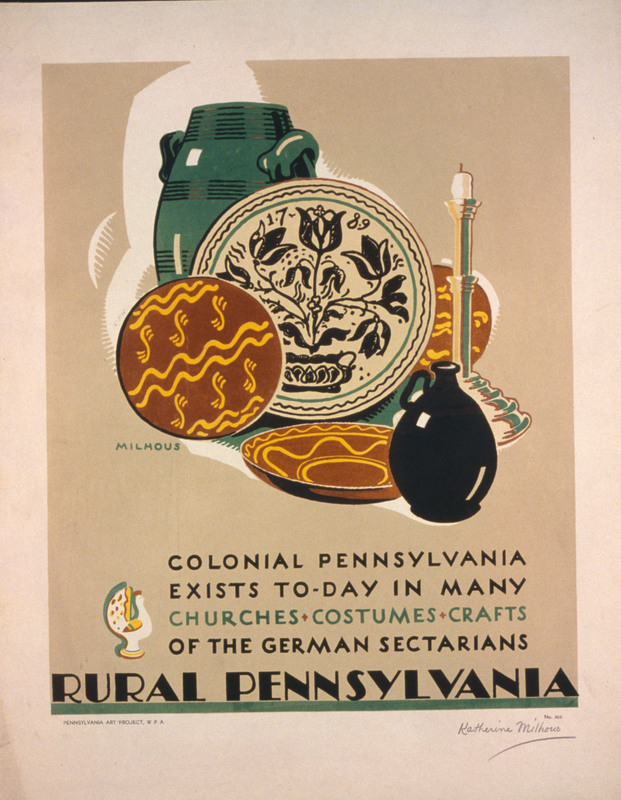 Federal Art Project poster on Pennsylvania German crafts created by Katharine Milhous, circa 1938. Flip to Recreational music class, Harrisburg Central High School, Harrisburg, PA, May 14, 1935. During the 1930s, thousands of artists employed by the WPA's Federal Art Project (FAP) created several hundred thousand pieces of publicly-funded art, including thousands of murals in public buildings all across the country, and posters on labor, education, travel, and a host of other subjects. Working for the FAP, Philadelphian Katharine Milhous produced a series of posters on rural Pennsylvania, including this one on Pennsylvania German crafts. Milhous would go on to become an award-winning writer and illustrator of children's books, including Lovina: A story of the Pennsylvania Country, and Snow Over Bethlehem.